If images of lightsaber clashes from “Star Wars” movies come to mind when the word laser is mentioned, we’d like to expose you to the healing, not harming, effects of laser therapy! Used in our practice now since 2013, cold laser is a safe, noninvasive form of healing therapy. Why Is It Called Cold Laser? 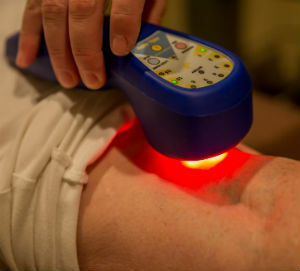 Unlike the lasers used in galactic battles which can burn a hole through a person, cold laser therapy uses light therapy. This state-of-the-art therapy has an unparalleled ability to reduce inflammation — the cause of all pain — and regenerate tissue. My colleagues and I have created a new company in addition to what we do here at the practice: Cold Laser Protocols; we will soon be launching the company with the purpose of educating doctors worldwide on how to use cold laser therapy. Through trial and error, my partners and I have created joint-specific protocols. If you’ve been putting up with persistent joint pain and are looking for relief, we invite you to consider cold laser therapy at Baywest Health & Rehab, LLC. You’ll find that you will be able to get out of pain quickly, efficiently and affordably. If you or a family member have been suffering from joint pain, we encourage you to contact the practice today for a consultation. We’ll let you know if you’re a good candidate for cold laser therapy!